Google officially unveiled their new Nexus 4 smartphone and Nexus 10 tablet on their blog today. Both of these devices have the latest Android 4.2 Jelly Bean operating system. The Nexus 4 smartphone specs include a 4.7" crisp display at 1280-by-768 (320 ppi) with Corning® Gorilla® Glass 2, Qualcomm Snapdragon™ S4 processor, 2 GB RAM, and 8 GB/16 GB storage. Pricing for the Nexus 4 starts at $299 for 8 GB and $348 for the 16 GB (unlocked and without contract). This smartphone will be available on the Google Play Store in the U.S., U.K., Australia, France, Germany, Spain and Canada on November 13. The Nexus 10 tablet specs include a 10.055" display at 2560-by-1600 (300ppi), Dual-Core A15 processor, 2 GB RAM, and 16 GB/32 GB storage. 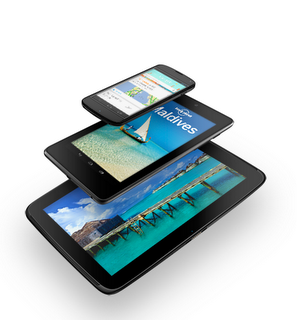 Pricing for the Nexus 10 starts at $399 for the 16 GB and $499 for the 32 GB. This tablet will be available on the Google Play Store in the U.S., U.K., Australia, France, Germany, Spain, Canada and Japan on November 13. Fore more information on the Google Nexus devices, you can check http://www.google.com/nexus/.